If a wordless book gets picked up by a foreign publisher there’s nothing to translate, right? Nope! There’s the title. The chosen title may sound strange or awkward or just plain dull when translated directly, so books can end up with completely different titles in different countries. 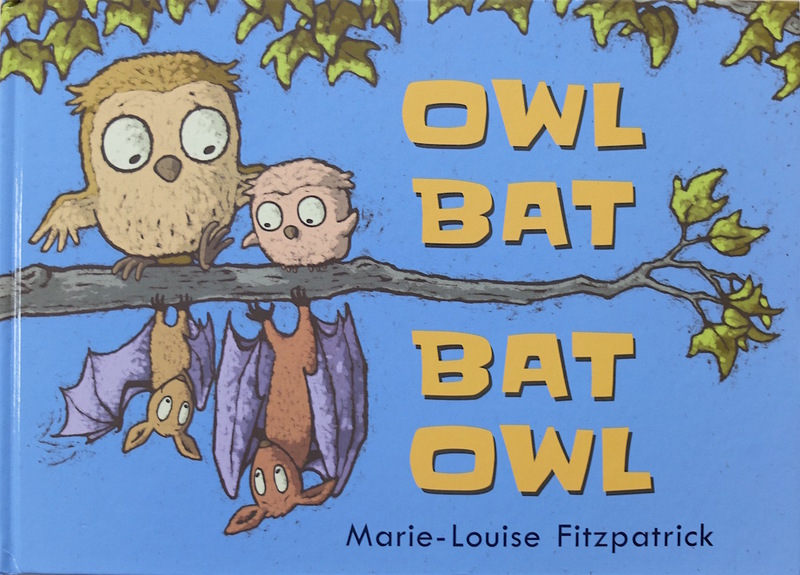 I love the sound of Owl Bat Bat Owl – the roundness of ‘owl’ and the abruptness of ‘bat’ fit the story perfectly, and the lack of punctuation helps to keep the emphasis even and flowing. 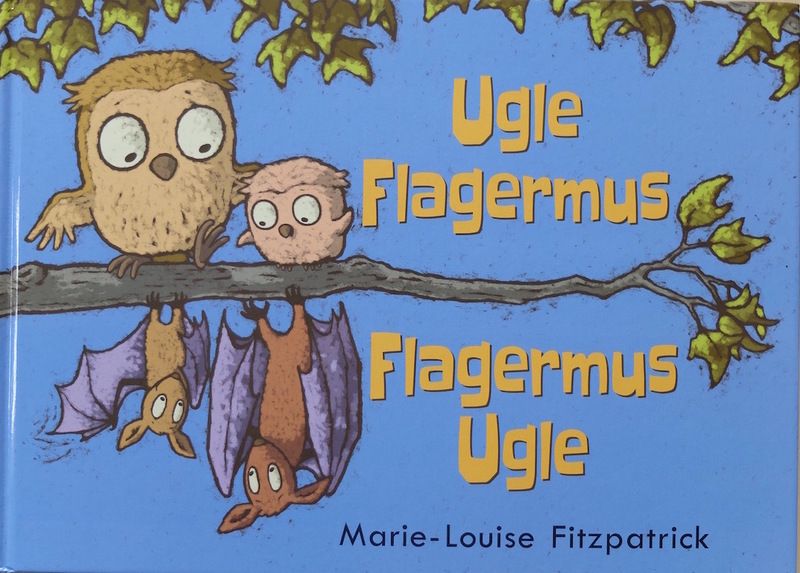 As a title it encapsulates the beginning of the book when the bats are refugees ‘invading’ the owls’ perch, and the end, when they are friends and intermingling. But the very elements which please the ear and eye in English may get lost in translation so each publisher will make a decision to keep the original title or change it to something which works better in their language. The Danish publisher chose to translate directly, and you can see how visually different it looks, though it still sounds good (to my ear). The type size has been reduced quite a bit to accommodate ‘flagermus’ and it was set in upper and lower case with some wave action on the words to keep the effect soft. 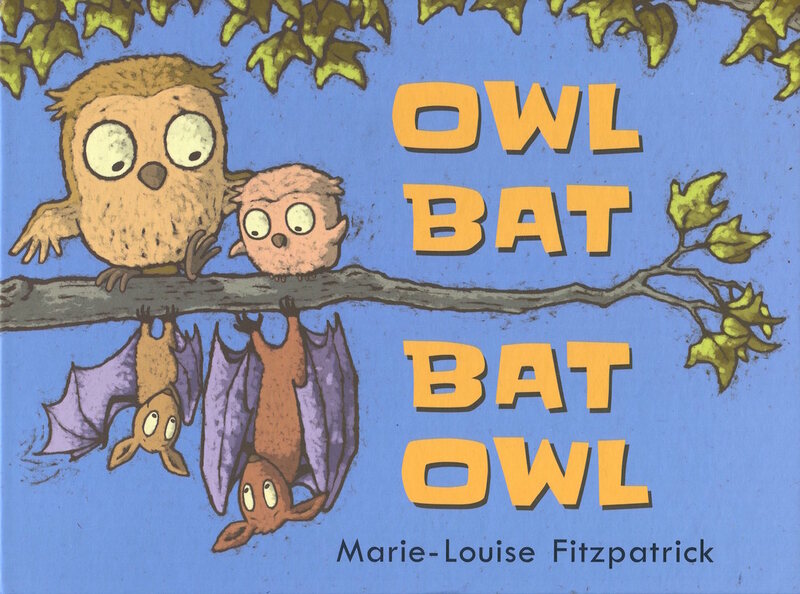 In the Taiwanese edition the title is Owl Bat without the repeat – the two words take up all the available space. 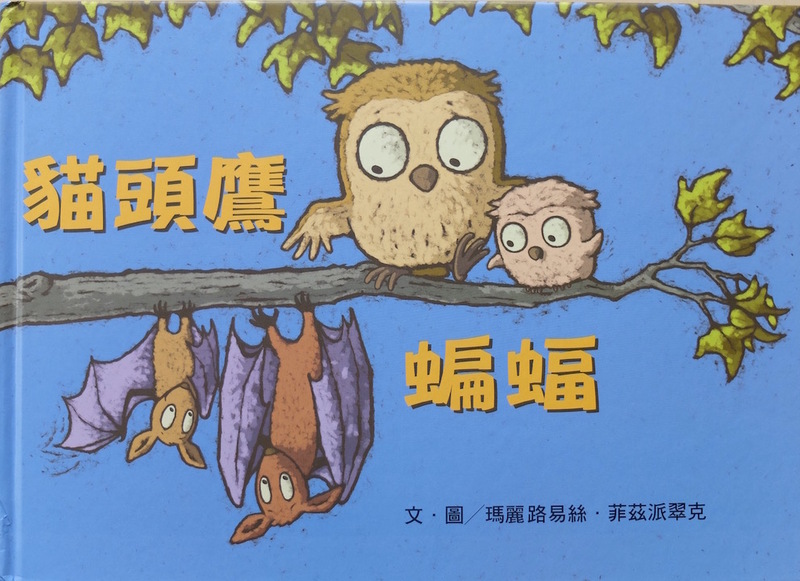 The Taiwanese publishers also requested a change to the cover to allow some text on the left, so I moved the owls over to the right for them. 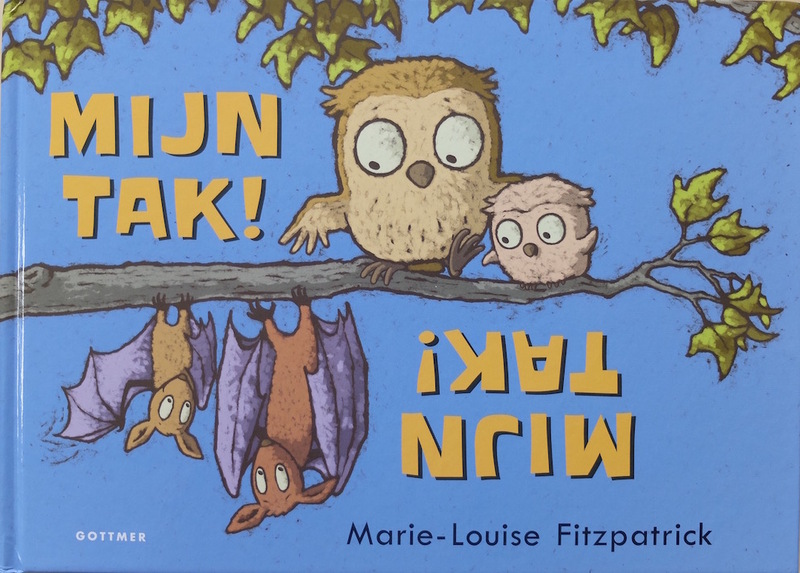 The Dutch publisher also used this version of the cover and changed the title completely to My Branch! My Branch! Those exclamation marks add vehemence. Much to my delight they flipped the second ‘My Branch’ upside-down. Publishers are usually resistant to flipping text in a title – I know, I’ve tried to get them to do it a few times! The Italian title reverse translates to something like ‘head up, upside down’, which sounds clumsy in English but looks good and sounds melodic in Italian. 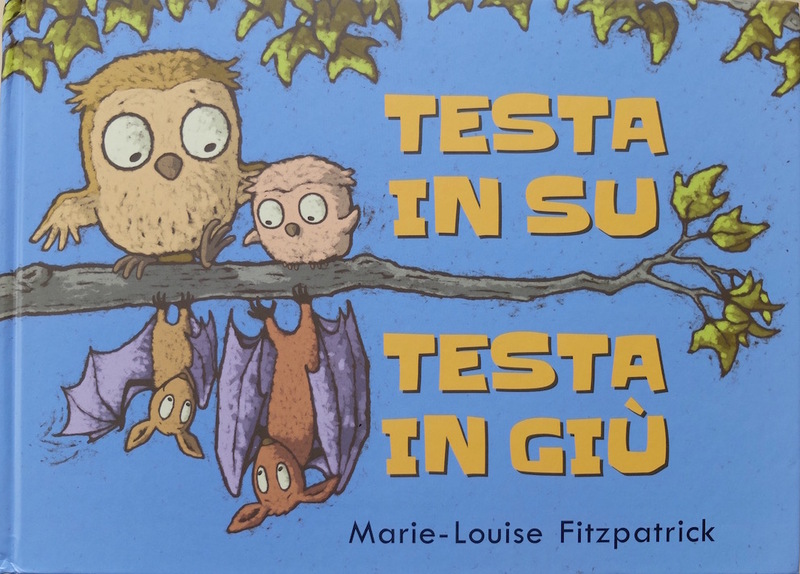 When I told my Italian-speaking sister the Italian version was called ‘something su, something gu’ she correctly guessed, ‘Testa in Su, Testa in Giu,’ immediately. 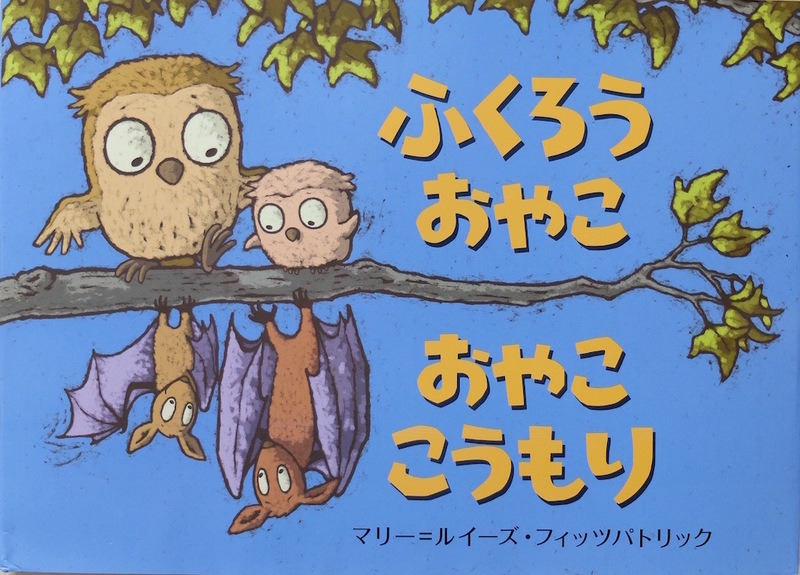 *Thanks to Mio Debnam and Kris Tsang I now know this translates as ‘Owl Family, Family Bat’. Picturebooks are mostly 32 pages long for several reasons. One is paper size. The maximum size sheet of paper a press can take depends on the size of the press itself. However, paper needs to maintain stability as it goes through the press and the larger the sheet in a four-colour print run, the more likely it will stretch slightly as it gets inked, causing the colour to go out of register. So there are limits to how large a sheet of paper is used for a picturebook run. Depending on its dimensions, a 32 page book may be printed on 1 single sheet (16 individual pages on either side = 32), or split between 2 sheets of paper, each with 8 pages on either side. The Sleeping Giant was printed on 2 sheets and the images below show the imposition proof of the first section. Because this is a test proof it’s on cheap thin paper. Also it has been rolling around our studio for several years which is why it’s so crumpled and tatty! I’ve added the page numbers on top so you can see the way the imposition works – the 16 pages are organised on the sheet so they will all end up in the right place when it is folded by the folding machine. Once the imposition sheet has been folded to check this, the print run can go ahead. The imposition print is also called the ‘blue copy’ because it was formerly printed only in blue. On this close up of the imposition sheet you can see the fold/trim lines which don’t appear on the final printed sheets. 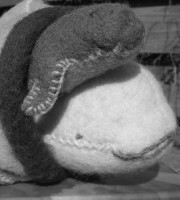 Some artwork is ‘bleeding’ over the trim line. Illustrators always add ‘bleed’ (10-15mm) to images to allow for slight shifts when the folded section is trimmed on three sides. Picturebooks are many different shapes and sizes but ultimately they need to fit within a certain size of paper to be competitively priced. 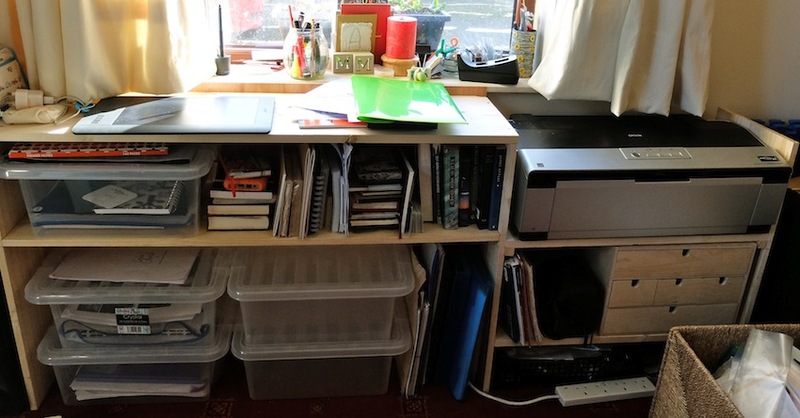 Sometimes publishers produce over-size books, or one which is extra tall or extra wide, and some picturebooks are pushed to 48 pages (an extra 16 pages/1 sheet) – but extra sheets mean an extra print-run & time & ink and all add to the cost. 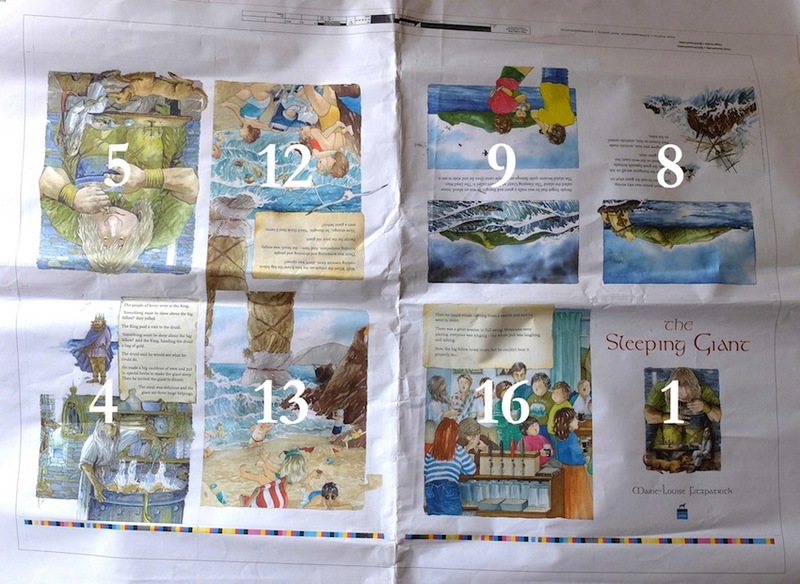 Picturebooks also come as 24 pages, 40, 56, but the pages are always in multiples of 8. You can’t add or subtract a random number of pages – say 2, or 4. 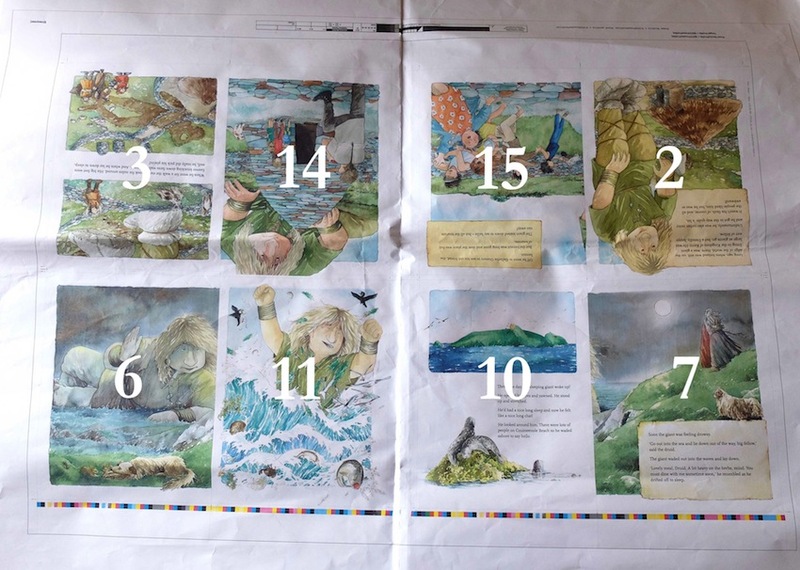 The thing is, while paper size and cost may be the main reason why the 32 page picturebook is the most common, it is a length which works very well. A 24 page book is quite short, so is often used for baby books, while 48 pages may feel like the story is being dragged out. 32 pages has a Goldilocks’ rightness to it! 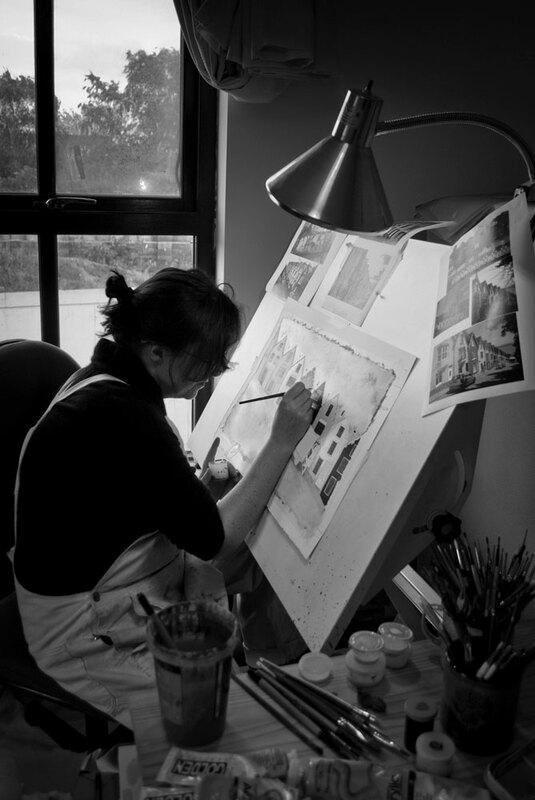 Note for any illustrator thinking of creating their first picturebook: the publisher looks after these technical details of preparing the art for print. Also, they will decide the size and dimensions with you. If you want to rough up an idea within ‘acceptable’ dimensions try finding a book that is a size and shape which you feel suits your idea, and use its measurements as a guide. Bear in mind that paper sizes vary a little worldwide and that the publisher may suggest changes, so don’t get too wedded to an exact size too early in the process.